Manila Observatory Executive Director Gemma Narisma, PhD delivered a talk on Space-Based Information for Understanding Atmospheric Hazards in Disaster Risk on 20 July as part of the National Science and Technology Week (NSTW). 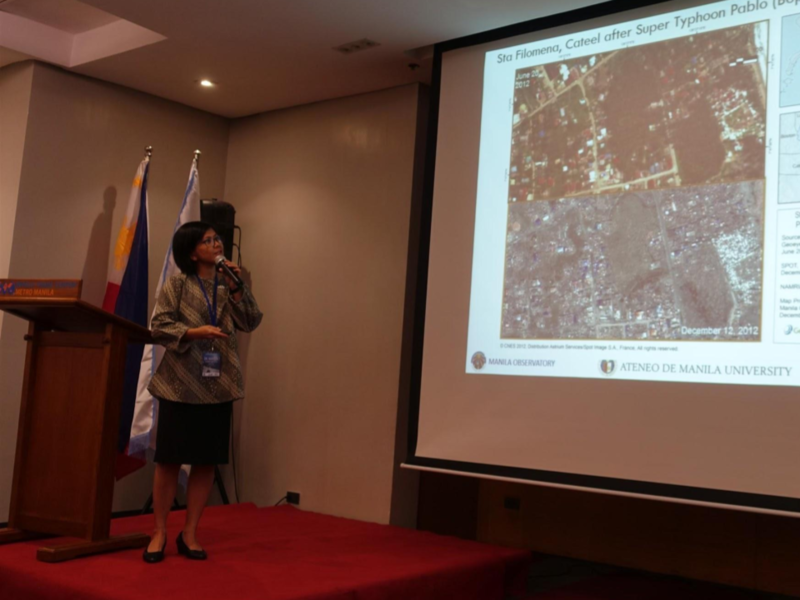 In her talk, Dr. Narisma emphasized on the role of space-based information in MO research, “[it] gives us a holistic perspective—completes the picture when a particular extreme event happens.” This strategy was used in making extreme weather reports for Typhoon Bopha (Pablo) in 2014 and the 2013 habagat rains. The analysis of the potential damage caused by a typhoon or an extreme weather event largely depends on the use of space-based information. But besides the thinking along the lines of potential damages, space-based technology has become more of use to disaster risk reduction and building resilience. Dr. Narisma pointed out that this is a new way of thinking and institutions are now considering incorporating space technology in the post-2015 disaster risk reduction framework.